Final scores Ocean Grove 12.12 (84) defeated Queenscliff 9.11 (65) at Queenscliff Recreation Reserve. The sixth-placed Grubbers ended the season with a 10-8 record, while Queenscliff (11-7) dipped to fifth spot and will meet Geelong Amateur in this Sunday’s elimination final at Leopold. It was a blow for the Coutas, a Queenscliff win would have secured a top three finals spot and double chance. 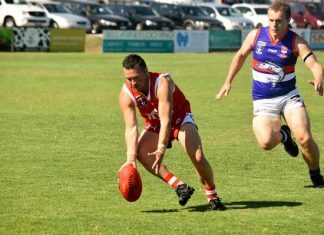 Ocean Grove coach Paul Lynch described it as a ‘bittersweet’ way to end its season with their finals hopes ruled out before the round 18 clash. “Yeah it is bittersweet but that is footy, that is sport,” Lynch told the Voice after the match. “There is always going to be (teams) that miss out – I thought we were probably as good as the sides in there (in the top five). Lynch said his side matched up well against the Coutas on the big surrounds at Queenscliff. Ocean Grove chalked up two victories against Queenscliff this season – including their 14-point win in Round 7. “You are probably right I thought we do match up well against them,” he said. Grubber sharpshooter Jake Carmody booted four majors, which took his season goal tally to 41 from 16 matches. Forward Matt Caldow continued his late season surge and finished with three goals. Queenscliff kicked with the wind in the first term as Couta forward Brayden Warren, a former Grubber player, took some strong marks and had two goals by quarter time. Undisciplined play saw an inaccurate Queenscliff give up a 50-metre penalty which resulted in a goal to Corey Walter in the first term. The visitors extended their margin out 19 points at the main break. Conditions became more difficult after half time with heavy band of rain and high winds settling in on the wet surrounds at Queenscliff. “It was slippery we did warn them (players) on the Thursday night before the match the ground was going to be slippery because of the rain,” Lynch said. Grubber pair Isaac Wilkins and Jahd Anderson revelled in the wet after half time and won plenty of the ball, while youngster Mitch Lindkvist showed promising signs. Queenscliff got within five points at three quarter time, but it was Ocean Grove which held on in the end. RESERVESThe Grubbers will meet arch rivals Barwon Heads in this Sunday’s BFL Reserves grade elimination final at Leopold courtesy of its 24-point win over Queenscliff. 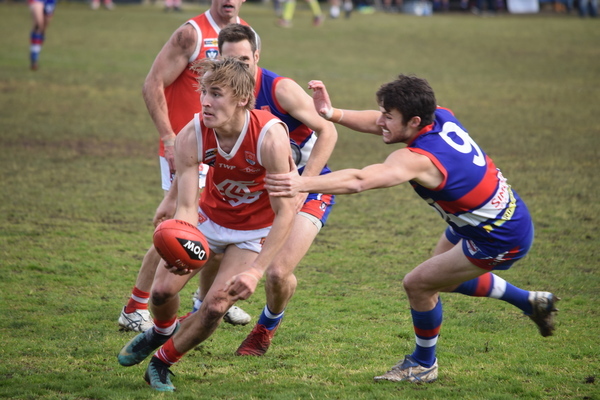 It was fifth versus sixth and a pre elimination knockout final with Ocean Grove narrowly ahead of Queenscliff on the ladder on percentage before the game. Final scores Ocean Grove 9.8 (62) to Queenscliff 5.8 (38). The Grubbers kept the home side goalless in the first term and led by 13 points at the first break. Despite Queenscliff kicking with the wind in the second term, Ocean Grove took a 10-point advantage at half time. Ocean Grove’s third term five-goal blitz saw the visitors trail by 40 points at the final break. The home side’s intensity lifted in the fourth term and squeezed the margin back to 18 points with a few minutes remaining, however a late Grubber goal sealed its finals berth. Ocean Grove forward Ryan Baker finished with two goals, while Adam Gerdtz, Edward Cartledge, Cameron Marchbank and James Peers were named in the Grubbers’ best players. 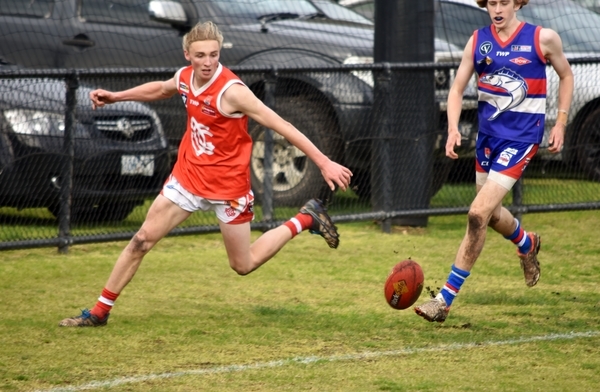 Ocean Grove narrowly missed out on percentage in securing top spot in the Under 19 Division Two Bendigo Bank Cup competition despite its 102-point demolition of Queenscliff. Final scores Ocean Grove 17.16 (118) to Queenscliff 2.4 (16). Geelong West Giants 1’s whopping 128-point victory over Lara on Saturday gave them top spot and earned a week’s rest. Both Geelong West Giants and Ocean Grove finished the season with a 13-4 record after 17 rounds with the Giants ahead of the Grubbers on percentage. The Grubbers put on a dominant exhibition against the Coutas and finished with a six-goal fourth term blitz. Max Sutton was named best afield with four goals, while Harley Pearce booted majors. Fletcher Long and Joe McDonald both kicked three goals, while Sam Beasley chimed with two majors for Ocean Grove. Ocean Grove Under 19s will now meet Bell Park in this weekend’s qualifying final. Goal Kickers: J. Carmody 4, M. Caldow 3, I. Wilkins, T. Gavin, C. Walter, A. Jarvis, K. Williams. Best Players: I. Wilkins, J. Anderson, J. Carmody, L. Cartelli, M. Lindkvist, P. Hardy.